Mukilteo lies along the shores of the Puget Sound in Snohomish County, about 25 miles north of Seattle. It’s often ranked among the best cities to live in the entire nation, by multiple publications, including CNN Money. It enjoys an especially idyllic location for waterside living, close to the city as well as being home to a Washington State Ferries terminal, which links it to Whidbey Island. Prospective Mukilteo waterfront real estate buyers will also find highly-ranked schools, a small town retail core and some of the very best views in the entire state, including not only the Sound, but the Olympics beyond, as well as breathtaking sunsets. 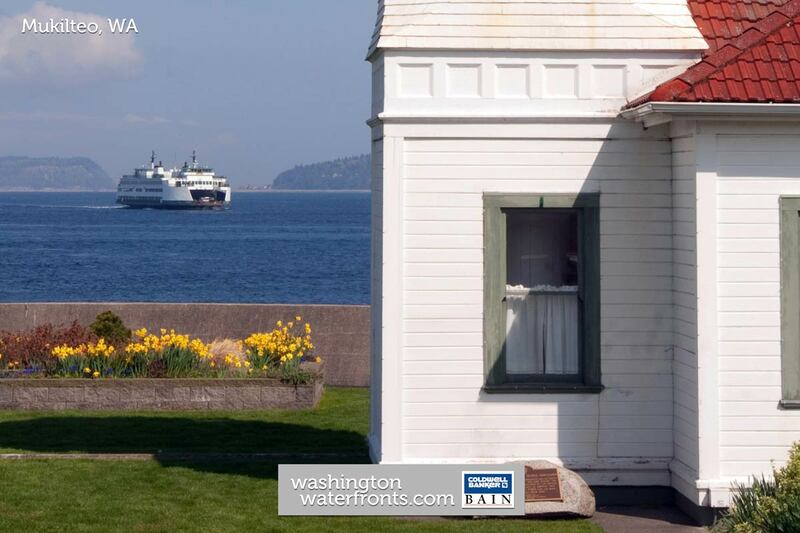 While Mukilteo waterfront real estate owners may be able to enjoy beach combing and even launching their boat right from home, beautiful Mukilteo Lighthouse Park in Old Town along the coast has a four-lane boat launch ramp as well as 1,500 feet of saltwater shoreline. It’s a great place for a picnic too, complete with glorious Sound views. For those into diving, it also offers unique and colorful underwater marine life, including eels, octopus, crabs of all types and an abundance of fish. Old Town also hosts a number of shops and fine restaurants, a community center and the Mukilteo Chocolate Company. At the southern end of town, the Harbour Point Village Center has a European feel and more local eateries, shops and services. Mukilteo waterfront real estate buyers will discover the opportunity to truly live the good life with urban amenities minutes away and a host of outdoor adventures and scenery at their door step in what’s been called one of the Seattle area’s, and the nation’s, most amazing towns in which to live. Home prices are reasonable by Seattle standards, making it easier to realize your dream home where you can enjoy a saltwater breeze, expansive western views of the Sound and the Olympics, and a fabulous feeling of seclusion. Take advantage of our industry-leading tools to make your property search as easy as possible and be sure to register for a FREE account so that you can receive email alerts whenever new Mukilteo waterfront real estate for sale hits the market. If you're seeking to sell your Mukilteo waterfront property, contact our Waterfront Specialists directly for a comprehensive listing analysis and to learn more about the cutting-edge marketing strategies we'll use to sell your home quickly for top dollar!